Starting a new dance program is a very difficult decision both for the dancer and their family. Juliana's Academy of Dance is a family in itself and welcomes new dancers throughout the year. Dance competitions by nature turn performing into a sport and instructors into choreographers that coach. 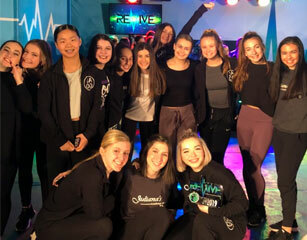 Miss Julie and her staff are qualified, award-winning choreographers and dance educators who teach students to focus on the love of dance and performing. Students are taught to work as a team toward their fullest potential as artists, athletes, and performers. Juliana’s Competition Team will be known as a “Team” which provides additional training, rehearsal and class time. Open auditions occur in the spring & final placement in August at Fusion Dance Camp. Upon completing camp, teachers meet with you to assign and enroll students for the competition season. Students must maintain excellent attendance, unexcused absences in a class could result in being removed from a routine or Team. Teams will focus on quality rather than quantity of routines. School activities are excused if JAOD teachers are informed prior to class by submitting an absentee slip to office staff. If the student is ill and/or unable to dance, please contact the office, otherwise, it will be considered unexcused. JAOD Teamwear Jackets are worn by all students at competitions and conventions to foster a spirit of the team and can be purchased at any time from the teamwear store. How much do they dance? Competitive students dance anywhere from 2-5 days per week and are required to attend various competitions and conventions to supplement their education each year. Ample time will be given to planning events into schedules. Extenuating circumstances will be taken in consideration on an individual basis. In addition to the required classes, many elite dancers choose to enroll in “Unlimited” classes and increase their time in class with extra ballet, technique and guest choreo numbers (by audition only). Unlimited class tuition fees do not include fees for privates, solos and/or duets.